While troubleshooting computer failures, we can rely on one built in tool provided by Microsoft to gather information regarding potential failed features. This feature called Problem Step Recorder (PSR) and it helps you to record all activities on your computer by Operating System itself and convert the result into an MHTML file format. It is supported by both Windows 8 and 7. By reading this output file, you can identify the last done operation and it helps you to make a correct solution for your computer issue. To start Problem Step Recorder on your Windows 7 and 8 computers, follow the steps below. Now press enter to open PSR window. Now it will start to record all kinds of errors and problems with your computer and store the result as a single zip MHTML file. When you need to stop this recording you should click on Stop Record. If you need to pause the recording, click on Pause Record. When click stop, the record will be saved on your computer with the name and location you specified. 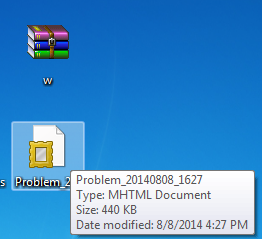 The PSR record is a zipped file in MHTML format. You should extract it and open in a web browser to see all the operations going on your computer with screenshots. Once you click the button 'Stop Record', it will be saved on your computer in zipped format. To view the activities saved on the file, you should unzip it. You can unzip the file by following the steps below. This feature is very helpful to identify all the operations done on a PC because of the screenshots it took while recording. The captured images tell us what happened on the PC while we had been running the Problem Step Recorder. This feature is a boon for newbie users because whenever they face any troubles with their laptops, a technician can simply ask them to start Problem Step Recorder and record all the events occurred while the user faced troubles with his laptop. By analyzing the captured images and data, a hardware technician can easily identify the real issue and fix it.